Maqbool’s stocks olives, freekeh, herbs, spices, almonds and olive oil from the Yaffa brand. 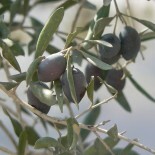 Yaffa olive oil, olives and freekeh (green wheat, often used in soups) are all sourced from the Jenin area of the West Bank. Herbs, spices and almonds also come from various parts of the West Bank. This entry was posted on December 3, 2012 by Sarah Irving in Food, Olive Oil and tagged almonds, Edinburgh, freekeh, herbs, Jenin, Newington, olive oil, olives, Palestine, spices, West Bank.